Readers may remember when, with a defense authorization bill in debate last June, two congressmen advanced an amendment banning military assistance to “openly neo-Nazi” and “fascist” militias waging war against Ukraine’s eastern regions. John Conyers and Ted Yoho got two things done in a stroke: They forced public acknowledgment that “the repulsive neo-Nazi Azov battalion,” as Conyers put it, was active, and they shamed the (also repulsive) Republican House to pass their legislative amendment unanimously. Obama signed the defense bill then at issue into law just before Thanksgiving. The Conyers-Yoho amendment was deleted but for a single phrase. 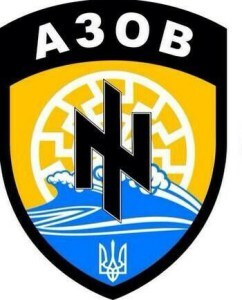 The bill thus authorizes, among much, much else, $300 million in aid this year to “the military and national security forces in Ukraine.” In a land ruled by euphemisms, the latter category designates the Azov battalion and the numerous other fascist militias on which the Poroshenko government is wholly dependent for its existence. An omnibus spending bill Obama signed a month later included an additional $250 million for the Ukraine army and its rightist adjuncts. This is your money, taxpayers, should you need reminding. As Obama signed these bills, the White House expressed its satisfaction that “ideological riders” had been stripped out of them. No, you read next to nothing of this in any American newspaper. Yes, you now know what the often-lethal combination of blindness and arrogance looks like in action. Yes, you can now see why American policy in Ukraine must fail if this crisis is ever to come to a rational, humane resolution. The funds just noted are in addition to a $1 billion loan guarantee—in essence another form of aid—that Secretary of State Kerry announced with fanfare last year. And that is in addition to the International Monetary Fund’s $40 billion bailout program, a $17.5 billion tranche of which is now pending. Since the I.M.F. is the external-relations arm of the U.S. Treasury (and Managing Director Christine Lagarde thus the Treasury’s public-relations face) this is a big commitment on the Obama administration’s part (which is to say yours and mine). How are things on the receiving end, it is natural to ask. Our money goes to exactly what? Until recently, what one heard and read of Ukraine’s progress into a neoliberal future was almost all happy talk (or silence, of course). Vice President Biden, who carries the Ukraine portfolio in the administration, makes regular trips to laud the Poroshenko government and the reformist zeal of Premier Yatsenyuk. This is perhaps only natural, given Biden’s son is neck-deep in Ukraine’s resource extraction industry. Biden sounded a different note during his latest trip to Kiev, which came in December. Yes, there was another handout, this one $190 million to help the Poroshenko government implement “structural reforms” of the usual antidemocratic kind. (Are you toting up all these checks?) But Biden was stern, make no mistake. He shook his finger from the podium in parliament. Back on the right path? Continue to make progress? Since euphemisms are an American export item, familiar in euphemism markets the world over, a translation: You are embarrassing us because you have done nothing. We gave you a window to pass legislation before the Ukrainian people figured out how awful it would make their lives. You’re blowing it as we speak. Hurry up. Meantime, here is another couple of hundred million.